We install and service all types of roof systems. Including but not limited to; EPDM (rubber), TPO (Thermo Plastic), metal, shingles, slate, tile, BUR (asphalt gravel), and modified. Free roof evaluations and estimates, Infrared thermal scanning, 24/7/365 emergency and non emergency repairs, preventative maintenance programs, and trained/skilled technicians. 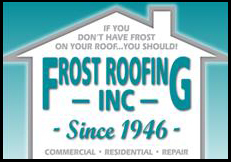 Family owned and operated, Frost Roofing is now lead by the fourth generation. James J.’s experience in the field and hard work up the corporate ladder has allowed Frost Roofing to remain the area’s leading roofing contractor. To this day, the entire Frost Roofing staff continues to run the family business with the same core values first envisioned by R.J. back in 1928.